If you choose to eat animal protein, chances are you prepare chicken more than any other kind. Chicken’s popularity is not surprising– it is very versatile to cook with, neutral in flavor, low in fat and more budget-friendly than beef or fish. But I think chicken can sometimes be TOO neutral in flavor, i.e. tasteless. And it can be TOO low in fat, such as with the breast meat and thus can end up getting dried out easily, especially when we’re being careful about cooking chicken all the way through. After making mediocre chicken for many years, my life was changed once I learned a few simple tricks to making chicken taste a whole lot better. Delicious, juicy chicken is in your future! Quality: I have done side-by-side taste comparisons with lots of different kinds of chickens and the best tasting bird I ever cooked was an organic, locally-raised pastured chicken by Healthy Family Farms. There’s definitely a more pure, chicken-y flavor from birds that have been raised out in the open versus in cramped quarters. And if it’s in your budget, I urge you to only buy organic meats. Click here for a more in-depth comparison of the different options you may have for chicken. Most people don’t have access to Kosher, organic, free-range chicken, but if you do, go for it and you can forgo all the pre-seasoning I’m about to recommend since kosher chicken has already been brined. Salt: The best thing you can do is to pre-season chicken with salt, especially a whole bird or thick bone-in, skin-on pieces. Just sprinkling a little salt on top of your chicken right before cooking it will only season the surface. But seasoning the chicken with salt well ahead of time or brining it in a salt-water solution will draw salt deep into the meat, resulting in a very tasty piece of chicken. But also, and just as important, the salt changes the cells in the chicken meat so that they will draw and hold more moisture than the chicken had before. So not only will the chicken be tastier, but it will be much juicier, too. You kill two birds with one stone! I did not just say that. See below for instructions on how to dry brine and wet brine. Timing: Well-seasoned chicken needs some advance planning. I sprinkle or dry rub kosher salt on chicken as soon as I get home from the market, rewrap it and put it in the refrigerator until I’m ready to cook it. You can do this as much as two days ahead, but less than 2-4 hours ahead doesn’t produce quite the effect you’re looking for. If you are pressed for time, (e.g. you get home from the market at 4:30 pm and you want to start cooking right away), then a wet brine is the perfect option since you can season bone-in pieces efficiently in 45 minutes. Whole birds take longer. 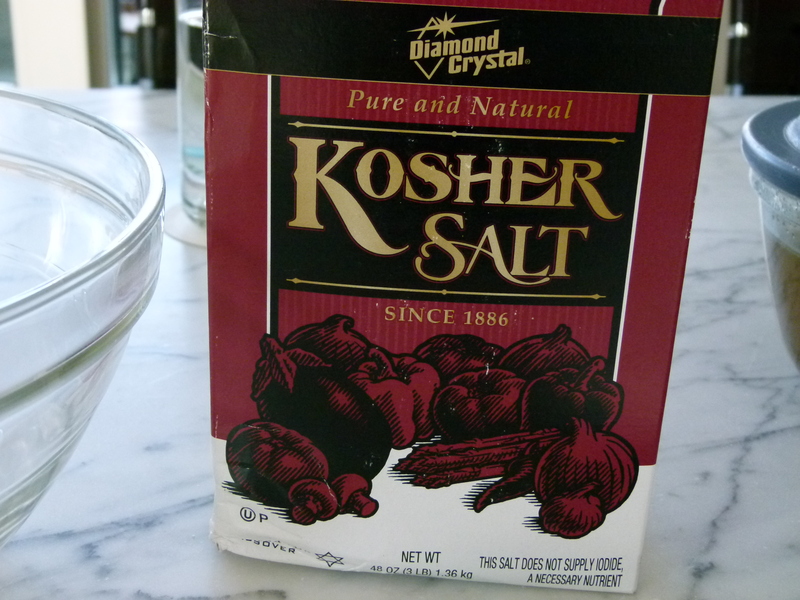 Basic Wet Brine: For 3 pounds of chicken pieces, in a large bowl dissolve 1/4 cup additive-free kosher salt (such as Diamond Crystal) in 1 cup hot water. Whisk to dissolve. Add 1 cup ice water and make sure the water is cool. If not, add a few pieces of ice. 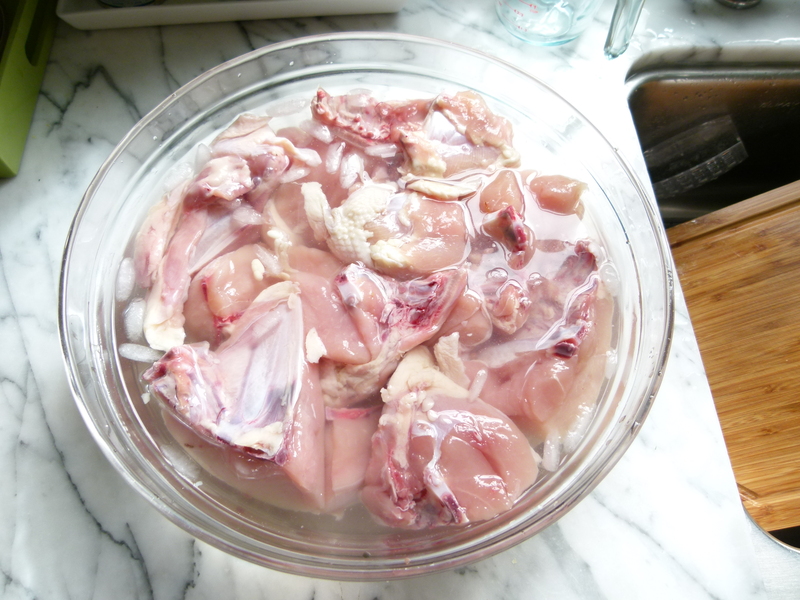 Place the chicken pieces in the brine and allow to soak for 45-90 minutes. 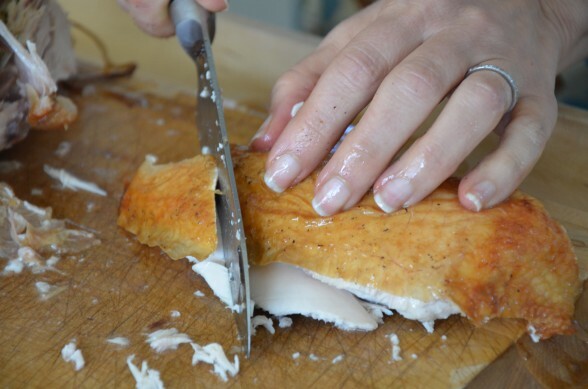 If you’re cooking the chicken right away, you can do this on the countertop. Drain the chicken and pat dry with paper towels before cooking. 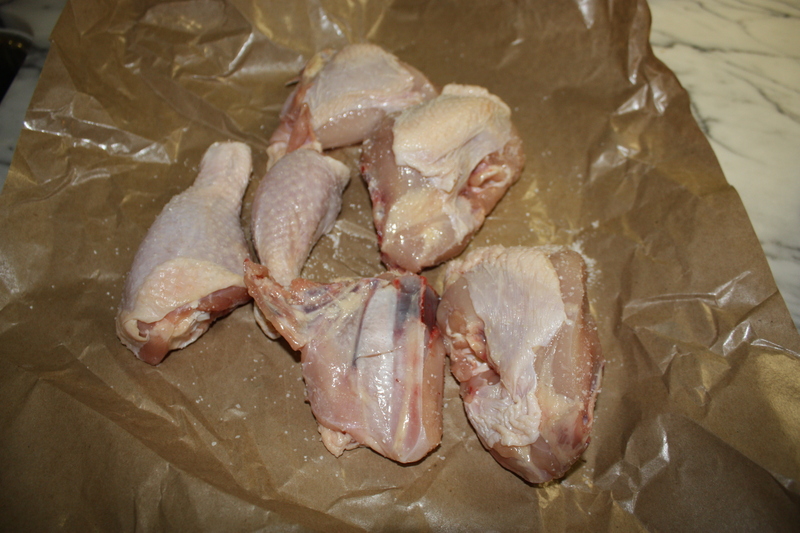 For a whole bird, use 1 cup kosher salt and 4 cups water. Brine for 2-3 hours in the refrigerator. I don’t normally brine cutlets, but many people do. You only need to soak boneless, skinless cutlets for about 30 minutes. Basic Dry Brine: Sprinkle 3 pounds of bone-in chicken pieces with 1/2 Tablespoon additive-free kosher salt or sea salt or a heaping Tablespoon for a whole chicken. Wrap and refrigerate until ready to use. Do not rinse. 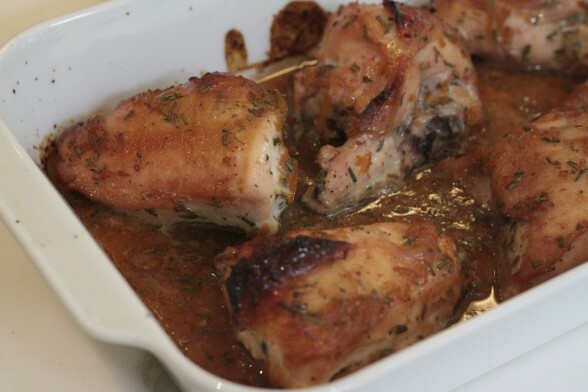 You can apply these tips to any chicken recipe you have (such as one of my favorites, Orange and Rosemary Glazed Chicken pictured above), but you may want to cut back on the salt in your recipe slightly since the chicken will already be salted. Look out for a fabulous recipe next week for Baked Chicken with Artichokes and Capers. So delicious and perfect for Easter or Passover! Thank you for sharing this I alaways saw my mom brine the chicken but never ask her why she do that?? I just got the answer here. If I am making your barbecue sauce for oven baked barbecue chicken, how long do you suggest I cook and at what temperature? Also, do you brown both sides of the breast and leg prior to baking in the barbecue sauce? Thank you! Can I share something with you? I despise touching raw meat, especially chicken. Sure, you can sprinkle the chicken with salt or use tongs to transfer and submerge them into a brine. Cutlets in wet brine only need about 30 minutes — you can do this at anytime (after you come home from the market or just before you want to start cooking). Wear rubber gloves to pat them dry afterwards — just a thought. I’ve never had dried out brined chicken, BUT cutlets don’t take too much time to cook, so be careful regardless. Let me know if you have any other questions! Hi, Pamela! So I went for it and made the Orange Rosemary Glazed Chicken, bone in and all. It was incredible. My husband said it was the best chicken I’ve ever made. (Of course that’s not saying much.) Just wanted to say thanks for the brining advice and another great recipe. Trying your lemon chicken next.. Thanks for the tip. I just salted my chicken and I am using one of your grilled chicken recipes for my daughter’s party this evening! Happy birthday to your daughter! Keep in mind, and maybe I should it bold it, you will need to adjust the salt in your recipes. For example, just a guess here, if you’re doing the lemon herb chicken with cutlets, you may not have to salt them at all since they’ll be in a marinade with salt. Otherwise, just cut most of the salt out of the marinade. Thank you for your great tips. I had been vegetarian for over 20 years and am pretty new to preparing meat in any form. I need all the help I can get. I am definitely going to try this as chicken can really get dry if you are not careful. It’s one of those small things that makes a big difference! You understood correctly, Marcia! No salting or brining necessary with a kosher chicken, but I still promote free-range and organic.